We gained 50 pounds in a single week! After our last longing 10 months study “hard” party “harder”, we deserved to rest at least for a week before entering in the real life. That is what we did. Rather than going to the new European Riviera in Croatia with the other 300+ fellows that wanted to dance on an island one last time all together, a group of 8 decided to road trip to Dordogne instead. 4 couples – 4 cars– 4 the best. We end up gaining one pound per day per person on average. Some took more (me), some took less (need confirmation who by the way). The first scientific experience for the human kind destiny was early done by a group of four. The braves decided after taking possession of their newly 5 bedrooms house in Saint-Amand-de-Coly, to investigate professionally of course the local restaurant recommended by the owner of the rented farm. Your humble writer does nor recall the name of the investigation made, but remember that for 20 € per person, the 7 course meal composed by Soup, Foie Gras toasted, Duck Confit, Roasted Potatoes, Crème Brule, Cognac was good enough for our 2 bottle of wine. The road back was as twisted as on the way in except that someone turned off the light in between. Jacques (the GPS) drove us back home for the first of a long series of difficult endorsement. But science had to explore, so be us. St-Amand-de-Coly is one of the most unusual villages in the Dordogne. 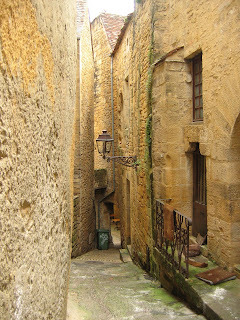 Each of its picturesque lanes leads to the fortified 13th-century Abbey Church, built by Augustinian monks. Its ramparts and towers give it an appearance that resembles a fortress rather than a place of worship. The short 12 hour sleep night, recycled our motivation to the up level of exploration mode extreme. 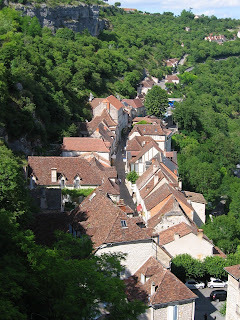 We, after a long breakfast composed of mushroom omelet, Foie Gras on toast and other butterish Croissants, investigate the beautiful village of Rocamadour. Built on the face of a sheer 492-foot cliff, this fortified 13th-century village has one of the most dramatic settings of any village in the world and was an important medieval pilgrimage site. Pilgrims flocked here from across Europe to perform penance by ascending the 216 steps of the Grand Stairway on their knees to pay homage to the Virgin Mary and seek miracles from St. Amadour. Just outside the Chapel of the Virgin Mary, set high into the cliff, is a sword said to be that of the heroic knight Roland. 4 Goat cheeses and one Foie Gras later we came back full of interesting new ideas about toasting the honored liver and the magic cheese. Kitchen was cleaned and ready to be used. 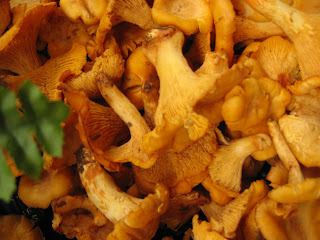 The extra pound was done within the dinner meal and was the first layer of the new scientific experience. Several bottle of wine help the Braves to endure the 12 hours sleep promise by the catalogue package in the food tour. Nonetheless, competition was tuff, and we needed some help. The war was pointing his (major) finger to us we only had one answer to him: “Bring me the Foie Gras!” The middle-eastern team was on the way to backed-up us on our most strategic effort: the speed. The length was OK so far, intensity was good, but speed was not. They came and we conquered. The next morning, breakfast helped us for our long journey. The new team of 6 had decided to endure the famous Gouffre de Padirac. 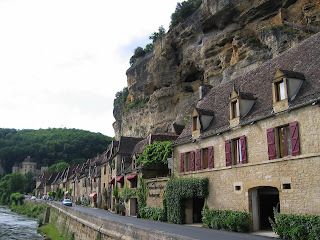 The Cave is about 20km east of Rocamadour (the village not the cheese) on the other side of the main Brive–Figeac road. An enormous limestone sinkhole, about 100m deep and over 100m wide, it contains some spectacular formations of stalactites and waterfalls created by the accumulation of lime, and beautiful underground lakes, but is very, very popular – so much so that it's best avoided at weekends and other peak periods, or you'll wait an age for tickets. Visits are partly on foot, partly by boat, and the guided tours last an hour and a half. In wet weather you'll need a waterproof jacket. We went back home to enjoy, the barbecued beef, cheese on toast and of course … hamburger - Foie Gras. Then, came the strength. The last but not the least part of our scientific team came over at night, joining force, spirit and also groceries to our new assignment. We decided the next day to expend our tasked land to the nearby region of wine. 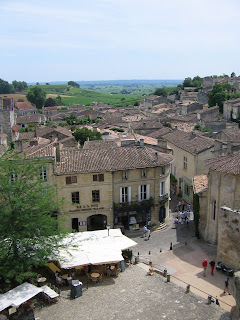 Saint-Emilion was our destination. It isn’t called the hill of a thousand châteaux for nothing. 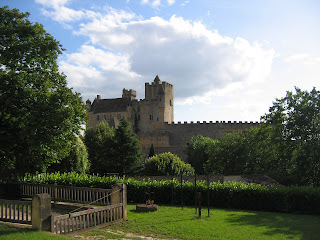 The delightful medieval town built on a hill swim over an ocean of vineyards and châteaux. It appears that the vineyards were introduced by the Romans in the 2nd Century AD. The steep cobblestone lanes, a heritage of the Middle Ages, and the Monolithic Romanesque church add to the town’s attraction. UNESCO has classified, not only the town, but also the wine-growing countryside of Saint Emilion, as a world heritage site, the latter including the surrounding communes of Montagne, Lussac, Puisseguin, and Saint Georges, which have the right to add Saint Emilion to the name of their wines. 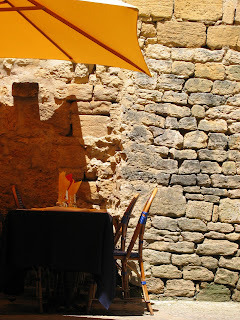 The Saint Emilion stop was a good stepping stone on our discovery of Bordeaux. Shopping and Beer were the only appetizers during the brief yet intense visit to one of the most beautiful city in the world (OK I am not objective, but still Bordeaux is worth a descent one day visit). Dinner was done at home for an interesting 2 styles Foie Gras-Duck Magret (sweet and sour). Yes the experience was way undergone, and some significant conclusions could be already drown from our intense exploration. The mission was not over yet. The best had to come, and we were not ready for it. The following day was the most intense and most dramatic in our conclusions. We headed to the capital of the local food. 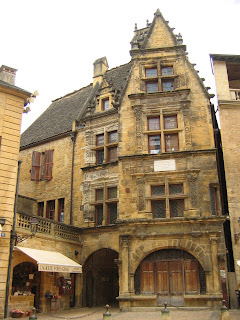 Sarlat is a historical monument, with one of the greatest concentrations of medieval, Renaissance and 17th-century façades in Europe. Step back in time as you meander through narrow, cobblestone streets, illuminated by gas lamps and lined with traditional Renaissance-style stone houses crowned with pepper pot chimneys. 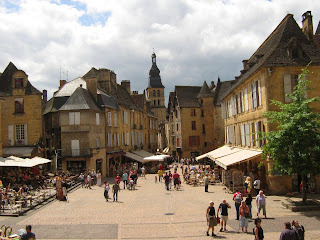 The heart of Sarlat is the Place de la Liberté, where every Wednesday and Saturday one of France’s most famous markets is held in a tradition dating from the Middle Ages. Lunch time was been held at one of the thousand restaurant that proposed some local food. Food, that we kept investigating for the purpose of the Human Science. Pictures, ice-cream, Foie-Gras groceries and portraits were the magic outcome of the normal life back there. 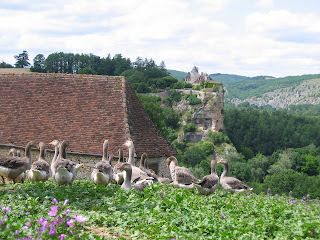 On the way back home to test the new recipe that we discovered on the journey, we stopped at a fantastic village, overlooking the Dordogne River. 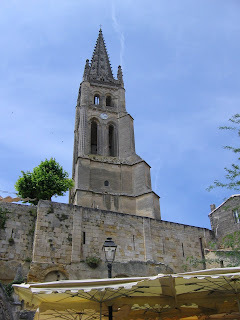 Domme is a true medieval bastide, or fortified village, and is still entered through its monumental gate, flanked by stout limestone towers. 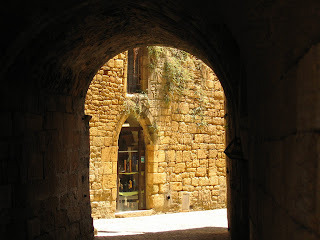 Graffiti, etched by the Knights Templar in the 14th century, still flecks the inner walls, while inside the town, the ancient beauty of Domme’s 13th- and 14th-century architecture is surpassed only by its exceptional views of the Dordogne River. That was only one stop in the final retreat. 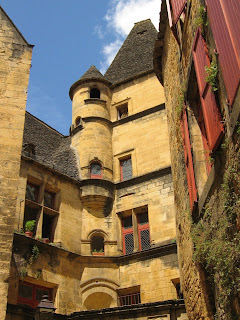 La Roque Gageac, Beynac and Cazenac Castles were surprising indulged by us. We stopped and gave a descent shot at each of them, looking, drinking and eating in each of them. The last day of our experience was time for data consolidation and final writings. We all agree to visit on the local cave to evaluate if the ancient were as convincing as the present days. The picturesque surrounding landscape inspired the region’s prehistoric inhabitants, whose vibrant depictions of nature and animals on the cave walls have earned them the prestigious designation of UNESCO World Heritage sites. Approximately 15,000 years BCE, unknown artists created Lascaux, the “Sistine Chapel of Prehistory,” where long-extinct aurochs, wild stallions and antelopes were rendered with exquisite beauty and skill. For preservation purposes, Lascaux II was created, a exact detailed replica of the cave using the same methods — magnesium dioxide blacks and iron oxide yellows and reds. After a week of investigation, time was over. We had to leave the place to the next scientific team, and go back to our new life. In conclusion, the experience was a great leap for us and a small leap for the Human Kind, but the final conclusion was plain and simple for our team: If you eat too much Foie Gras, you become Foie Gras. We hate so much that we were sick of eating Foie Gras all the time any manner we can think of. We were disgusting yet happier than ever. Fridge food was in the only excuse that was separating us from having a good meal downtown. Talks were only around food at breakfast, lunch and dinner time. During one week, we choose to give our body to science, the science of food. 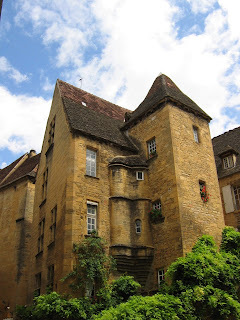 Dordogne is a very tuff country to visit for your body, if you are not ready to gain one pound a day, don’t go, you will suffer watching people eating like crazy. Too good thing can kill your appetite. I can’t wait to go back there and reborn again as a new Foie Gras. Probably the best value for money restaurant in the town. Not only they deserve to be lunched at, but alos they have a very descent wine list of course. Cheap is not the right word for describing this place but correct and interesting is what I like to call it. Not sure which one to say, or whci one to underligne here. So the best thing to do is probably ask your local bakery or butcher where you should eat tonight. If you prefer wine ask your local wine supplier and (s)he tell you the truth. We stayed at a house, 5 bedrooms - 2 bathrooms - 3 wc - Large living room and dining room - 1 kitchen for 700 € for the week. I booked online with a phone call next day to arrange the payment. 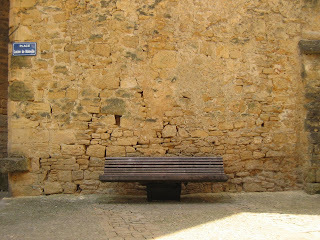 http://www.visitperigord.com/ was my provider and it was surprisingly efficient for once in France. Like it and can only recommend this place so far. The rest, you can't go wroong, renting a car and go around during your week pilgrimnage.